Livechatoo can alert you to new message and chats in two different ways. Visually – flashing the name of the browser or tab which you are logged in as Operator; or audibly – playing a ringtone for a new chat or incoming message. However, there are times when neither alert is enough and so we have prepared you a new feature – Desktop Notifications. What are Desktop Notifications ? How do you set them up ? Notifications are simple alerts appearing on your screen even when you have the browser minimised in the background. Events where you want to receive alerts can be set up for each operator separately. Do this through the operator interface in “Settings”. Right now you can set up notifications of a new incoming chat, missed chat, new message, new visitor or target page visitor. After the setting has been saved, browser authorization will be displayed to you the first time a notification appears. Depending on the browser you are using, the authorization may look different. If you accidentally blocked notifications, when the authorization appeared, click here and find out, how to make them work again. As is the case with several other functions, it tends to be more complicated in Internet Explorer. Notifications are not displayed as a special alert on the corner of the screen, but as a blinking notification in the taskbar. Authorising notifications in IE is peculiar, too. After logging into the Operator interface, click on the Livechatoo icon in the address bar, drag and pin it to the taskbar. 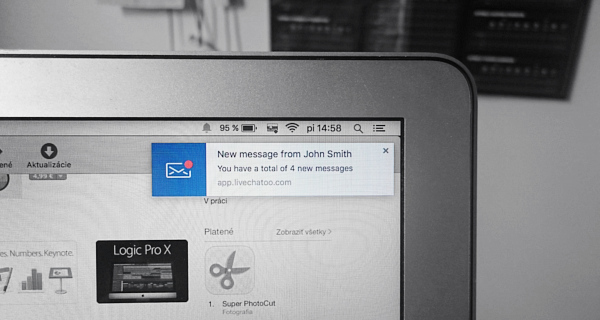 Mozilla Firefox displays notifications in just 5 seconds. This is a feature of the browser. Super gelungene webseite, habe ein paar wertvolle tipps erhalten die sehr hilfreich waren,danke.